What is your little girl like? Girly? Diva? Tom-boy? Rough and tumble? Audrina is so funny. She's 19 months old and very rough. She smashes and crashes through life. Climbs everything. Loves dirt and mess. At the same time, she is very much into clothes, shoes and outfits. She will not leave the house without her jacket, hat and boots. She cannot be missing one of those articles, not matter what the weather! Thank-you Bokkechick for the beautiful siggy! Alyssa is girly, she loves her dresses and fancy hairdos, but she also loves to get dirty and play outside. Hannah is just too little to tell just yet. Kayley can be girly at times and other times she doesn't mind getting dirty or playing with boys (her best friend is a boy)....I think she's a good mix. Trisha--proud stay at home mommy and wife. Rosalynn is girly but also rough and tumble. She just turned 3 and she has already had a concussion and staples from 2 different accidents. About a week ago she insisted on wearing a very pretty dress and nice shoes to the park so she could play baseball with the boys. Clara is to little to tell. She seems like she will be girlybut we will see. 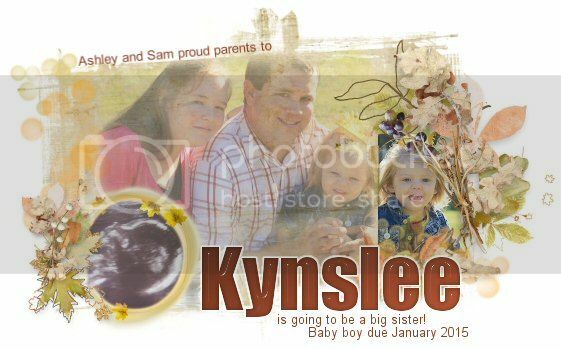 Kynslee is all around a mixture of everything - LOL From drama queen & girly to rough-tough. She loves her shoes and clothes and her hair accessories but also loves to play wrestle and being outside in the dirt. She loves both dolls and cars/trucks alike. Grace is very active, super silly, and sweet. Very observant and memorizes a lot of things. She's the only baby of the family so she might be picking up more adult behaviors than kid behavior. She did recently throw a big tantrum though so we aren't sure if that will continue. She's still a little too young to decide what her personality really will be. Hey Ya'll I'm a newbie and thought I would share about my daughters. Brianna is a mix of Tom boy she loves to play sports with the boys,but she does have a girly side to her since she is a cheerleader it's bring out the girly in her. Hayden is Girly and Rough and tumble She is the one who is always trying to get her older sisters and her twin to wrestle, she also loves to play dress up and get all girly like a princess. Cora is still very young so not sure just yet. My 14 year old, Phoebe, is a total tomboy. She wants to cut her hair short, she refuses to wear dresses or pretty things, she is loud and very rough-and-tumble, and she is always talking about how she wishes she was born a boy! I suspect this is because she grew up with a brother who is four years older. Caitlin, who is 11, is the complete opposite. She is very delicate, quiet, and girly and loves everything pretty and feminine. My daughter is also a tomboy kind she likes having short hairs and dresses like boys. Whereas, my niece is 15 years old and she is totally girly. She likes wearing a one piece, bikini and she does makeup on her own. We gave a pool party on her birthday and she wore a reversible bikini bottom which looked really awesome. Girls have there different choice of clothings we cannot style them according to us. Last edited by ChristinaD; December 15th, 2017 at 04:57 AM.